Meadowsweet, also known as queen of the meadow, bridewort, meadwort, dropwort and spiraea, is a striking, clump-forming perennial growing to a height of 2-4 ft. Meadowsweet bears large, dense heads of small, sweet-smelling, creamy white flowers on stiff reddish stems. The plant contains salicylates that act to ease pain in a similar way to aspirin. Meadowsweet is used internally with great effect on digestive problems, such as peptic ulcer, heartburn and gastritis. It has an analgesic effect and is of value to bring down fevers, as well as to treat the common cold. 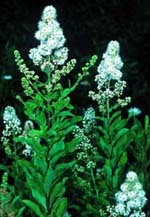 Furthermore, it is of value for rheumatism and arthritis and has a diuretic effect as well. For children it has benefit as an antipyretic, bringing down fever, and as a mild anti-diarrhea treatment.